You may recall my pleasant surprise at Steak ‘n’ Shake’s Carolina Slaw hot dog. 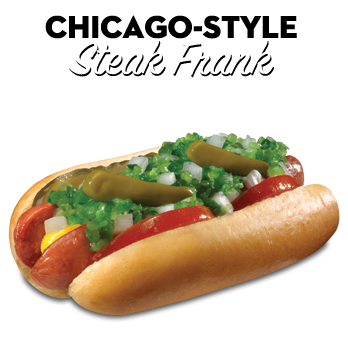 I was impressed by the quality of the frank itself, as well as by the clever use of ingredients. I’ve been back a couple times to sample some more of the line, and it’s been up and down. I haven’t tried all of them, but I did sample the Chicago Style and the Cheesy Cheddar. Here’s what I thought. Let’s start with the bad news. I wasn’t hugely impressed by the Chicago Style. It’s the first time I’ve had one, due to the unfortunate closing of the Pop’s near me, so my expectations were pretty high. For those not from the Midwest, a Chicago-style hot dog is topped with tomato, chopped onion, relish, pickles, peppers, and mustard. It’s much closer to a legitimate sandwich than most hot dogs, and the recipe is held in high regard. Steak ‘n’ Shake’s preparation hewed pretty close to the traditional, with the exception of a poppy seed bun. There wasn’t anything wrong with it, per se, although the sport peppers were much hotter than I expected so I removed the second one. It just felt kind of like a cheap imitation of a deluxe hamburger. I can see this being popular as a street vendor type food, especially if it’s comparatively inexpensive, but as an entree at a chain restaurant it didn’t exactly hold up. 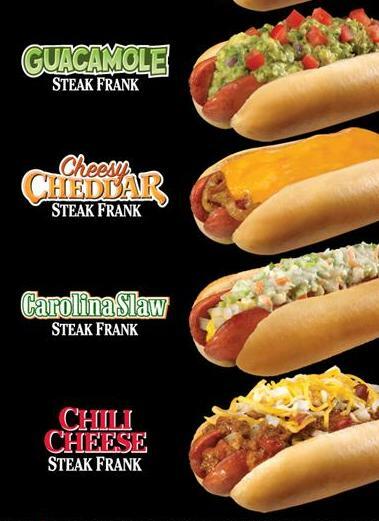 I was a bigger fan of the Cheesy Cheddar Steak Frank. I had actually ordered the Chili Cheese and been given the wrong dog, but I’m glad it happened. I wouldn’t have normally ordered it, since the ingredients are so basic. It almost feels like a waste of time. It seems that fate had plans for that hot dog, and it ended up being great. As with the Carolina Slaw, what made this frank work was the use of a few top shelf ingredients. The Cheddar cheese was delicious, and the inclusion of grilled onions added some subtle variety to the dog. On a sandwich like this, less is more. These Steak Franks run for about $4-5 in a combo, which isn’t too expensive to experiment. I’d recommend the Cheesy Cheddar, and if you like Chicago-style dogs this one seems somewhat authentic, although it wasn’t really to my tastes. I’d still rank the Carolina Slaw at Steak ‘n’ Shake’s best, but these aren’t bad, and we’ll have to see how the rest compare.